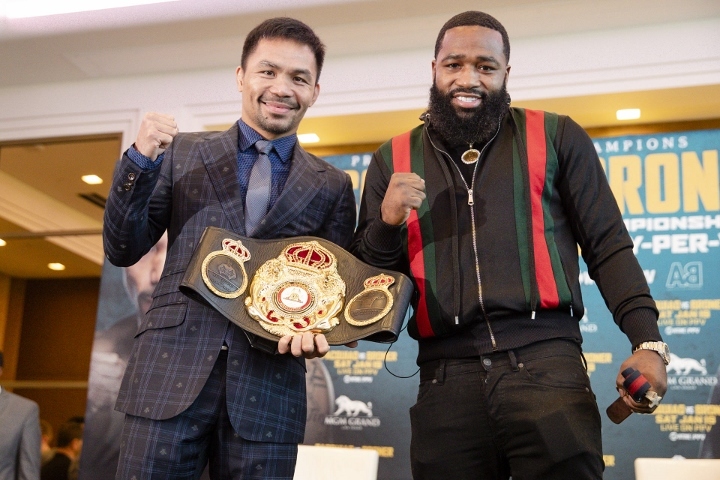 LAS VEGAS – Adrien Broner indicated Tuesday that he and Manny Pacquiao underwent Voluntary Anti-Doping Association testing leading up to their fight Saturday night because Broner demanded it. “It was VADA testing,” Broner told a small group of reporters Tuesday after making his “grand arrival” at MGM Grand. Pacquiao, 40, knocked out Argentina’s Lucas Matthysse on July 15 in Kuala Lumpur, Malaysia. That marked the first knockout for Pacquiao since he stopped Puerto Rico’ Miguel Cotto in the 12th round of their WBO welterweight title fight in November 2009. Broner didn’t disparage Pacquiao’s impressive victory in his last fight against Matthysse. The former four-division champion wasn’t interested, either, in discussing the differences between the VADA and USADA testing programs. VADA tests on behalf of the WBC for its “Clean Boxing Program.” USADA is the official testing agency for the Olympics, including the U.S. Olympic Boxing program. VADA testing generally is less expensive than USADA testing. Cincinnati’s Broner also knows he is satisfied with the PED testing administered leading up to his showdown with Pacquiao on Saturday night at MGM Grand Garden Arena in Las Vegas. “I feel real comfortable,” Broner said. Broner didn’t want to elaborate on what he meant by saying he “made some noise” regarding drug testing for his shot at Pacquiao, the WBA world welterweight champion. Broner referred to a video he released late in December, in which Broner contended neither he nor Pacquiao had been tested for PEDs to that point. The Philippines’ Pacquiao (60-7-2, 39 KOs) is commonly posted as about a 3-1 favorite against Broner (33-3-1, 24 KOs, 1 NC). Their 12-round, 147-pound championship bout will be the main event of Showtime’s four-fight, pay-per-view broadcast (9 p.m. ET/6 p.m. PT; $74.99 in HD). Miller: I’m Proof – Hard Work & Cheeseburgers Can Take You Far!